Olivia is a GroVia and/or GroBaby baby, if anyone is curious. I cloth diaper like 60% of the time and feel no guilt whatsoever about the other 40%. NONE. I also feel no guilt when I have extraordinarily long, hot showers. Since I have that new-baby-mom haven’t-showered-in-three-days funkiness to me at least once a week I feel like it evens out. This next shot is my ‘sweet shot’… I am SO pleased with it. I don’t know about you but I could spend like an hour nomnomnom-ing on those cheekies. Do you notice something different about these pictures? I’m using an old Yashica 55mm lens attached to my camera with an adaptor. Manual focus, whatwhaaat! It’s tricky, but I’m super in love and I go on to Christopher about how much I want to buy one actually made for my camera so I can have autofocus. Daily. And show him lots of pictures. And go on about bokeh in a really annoying voice. We can’t be smiling all the time. Life is stressful when you’re a baby. Juuuuuust kidding, no it’s not. I cloth diaper 95% of the time, going on 100%, but it has nothing to do with guilt. It is just that compared to using cloth, disposables gross me out! this one time, a long time ago, actually like 5 years ago, i had a canon rebel. and then, i went on a trip overseas and decided that i wanted a small pocket sized digital camera. so i traded in my canon rebel for like, $100 and got a digital piece o'junk that i don't even use anymore. biggest. mistake. ever. i really wish i had my canon. sigh. Look at those sweet faces! 🙂 And those eyes? Great photos! Precious. They are all sweet shots!! Manual focus?!?! I'm super impressed!! 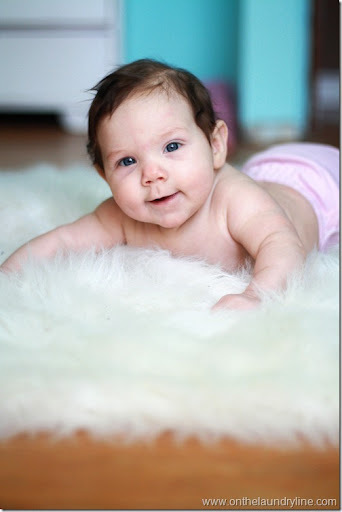 Sweet pictures of your little one!! Precious! Those eyes… oh man! Such a sweetie! Love her baby pink diaper! We were Fuzzibunz users ourselves! Great use of the adapter! 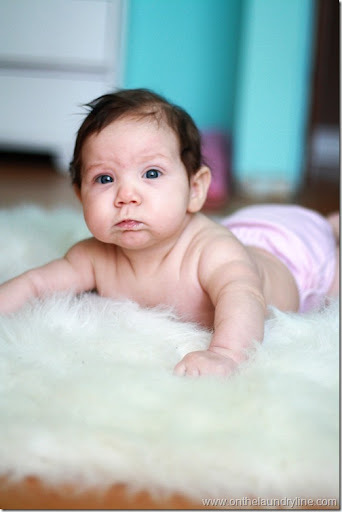 Totally a retro shot to the 1950's with the babies on the bear skin rugs! Adorable! these shots are absolutely adorable! !